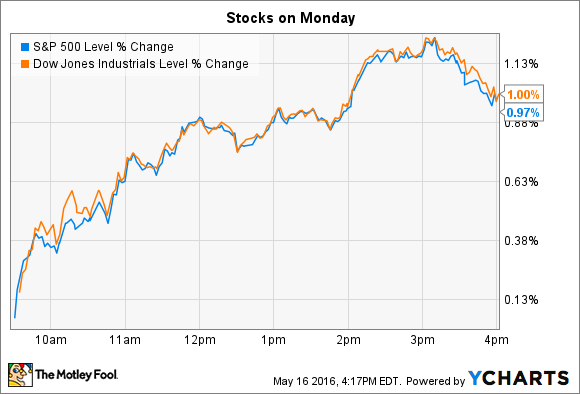 Why these two stocks broke away from stock market indexes on Monday. Energy stocks led all sectors up after oil prices set a fresh high for the year on news that global supply could be falling to rapidly meet up with lower demand. Rather than cratering toward $20 per barrel, oil has now bounced back up above $40 per barrel. As for individual stocks, Apple (NASDAQ:AAPL) and Anacor Pharmaceuticals (UNKNOWN:ANAC.DL) were two of the market's most notable movers following major news for their shareholders. Apple was the biggest mover on the Dow, jumping 4% after Warren Buffett's Berkshire Hathaway (NYSE:BRK-A) (NYSE:BRK-B) revealed that it had just established a big stake in the consumer tech titan. It accumulated 9.8 million shares for a total outlay of $1.1 billion. With that move, Berkshire stepped in to buy the stock near two-year lows as many Wall Street professionals, including billionaire activist investor Carl Icahn, sold out. Apple recently posted its first-ever decline in iPhone sales, which is pressuring sales and profit growth while raising the stakes on the next device launch. Yet Buffett apparently chose to take some of his best-known advice: "Be greedy when others are fearful." In an email to The Wall Street Journal, though, the Berkshire Hathaway CEO clarified that he wasn't responsible for the decision to establish an Apple position. That choice fell to one of his two chief investing managers, Todd Combs or Ted Weschler. While the Oracle of Omaha wasn't personally behind the purchase, the Berkshire move was still big enough news to draw fresh attention to Apple's enviable brand, rock-solid cash flow, and below-market valuation -- all characteristics that Buffett traditionally looks for in the businesses he signs up to own for the long term. Anacor Pharmaceuticals spiked 55% on news that it was being purchased by drug giant Pfizer (NYSE:PFE) for $5.2 billion in cash. The agreement looks like a done deal as both companies' executives have signed off on the merger. Pfizer made the purchase mainly to get its hands on Anacor's cisaborole, which is a topical treatment for eczema that's currently under review by the FDA. That drug represents "an attractive opportunity to address a significant unmet medical need for a large patient population with mild-to-moderate atopic dermatitis," a Pfizer executive said in a press release. "Crisaborole is a differentiated asset with compelling clinical data that, if approved, has the potential to be an important first-line treatment option for these patients and the physicians who treat them." Roughly 20 million Americans suffer from mild or moderate eczema and could find relief from this drug, according to Anacor. Pfizer will fund the purchase entirely through its cash holdings, and it sees the deal slightly lowering earnings next year before boosting profits beginning in 2018. Anacor shareholders, meanwhile, will receive $99 per share in cash as soon as the deal closes, which should be sometime in calendar Q3.